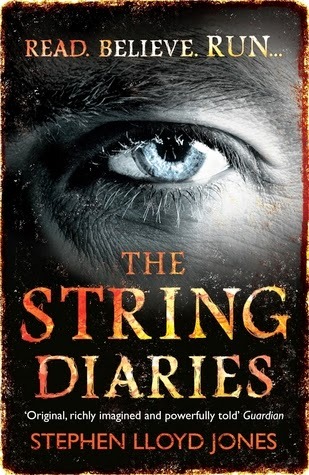 I've been keen to read The String Diaries ever since I read about the publishing deal being struck. A book about family relentlessly pursued down the generations by a man who can change his appearance at will? With their only tool for survival the knowledge of the family members gone before, written in a pile of tattered diaries held together with string? Ooooh, yes please! From the off, TSD has itself set to the highest gear possible, alternating chapters between the present, in which Hannah Wilde is trying to find her way to a safe-house in Snowdonia before her husband bleeds to death in the passenger seat, and late 70's Oxford where Professor Charles Meredith meets a mysterious French scholar who nicks his seat in the library. It's dramatic if you're British. She's also deathly afraid of some bloke who's been pursuing her all her life, and her mother before that, but that's really no excuse. Such divisions naturally mean it takes a few chapters to get into it, especially as there's also a third timeline, but despite the rather - in my view - over dramatic cliffhanger chapter endings, it works very well, skilfully passing the necessary exposition to the quieter chapters to allow Hannah's timeline to maintain its pace. I was drawn in fairly quickly and interested in all three stories. I also *loved* the idea behind this, and its mythology - I have no idea if the Hosszu Eletek are a real folk story, Google only brings back this book - there's such potential but its squandered, weakened by two-dimensional characters and a by-the-numbers plot for the set-up. In a fair or unfair point depending on if you, as I, are attracted by that particular aspect of the blurb - the string diaries of the title have little to do beyond existing, and that was a great disappointment. The main story is Hannah's, the dramatic escape, but I found her to be a deeply boring character who did little more than scream, weep, worry, and think to herself that she must protect her daughter and husband. There is a fine line between legitimate emotion and having a heroine who succumbs to inertia - consider The Hunger Games: the fear and PTSD was one of the bits it got really right, but Katniss still went out and got things done. Here, Hannah's actual actions - what there are of them - happen before the book has started; throughout, things are done by the (male - which I felt mattered in the context of the story) characters around her. When she does finally act, it is not in the way of somebody who has had the chance to spend their life preparing for the possibility she'll have to. Then there is Gabriel, a character straight out of any romantic comedy starring an Irishman: over friendly? Check. Turns rebuffs into jokes and ignores them? Check. Uses a small child to trap the object of his affection into spending time with him? Check. We'll grant some bonus points for Hannah's epically stupid reactions to him: What's that? You are on the run from a man who can change his appearance at will, there's a mysterious Irishman who is determined to be your friend, he makes your spidey sense tingle with mistrust, your husband almost died the day before and is lying prone on the sofa vulnerable to the aforementioned man who's hunting you and you ARE going to go for a ride with the mysterious and hunky stranger? The final nail in the coffin is Jakab himself - the man who's spent over a century tracking down Hannah's family. In the beginning he's done excellently, but his obsession is ludicrous, its explanation overly simplistic, and as he doesn't appear to exist off-screen let alone develop as a character over his lifetume. We have a faceless Big Bad who deserves his endlessly screaming target. It's even more annoying because what he *does* is so utterly horrific but the book is not; Jakab's victims only emotionally respond to the fear of violence but Jones has - possibly inadvertently - created a creature whose MO taps into a very female fear. I would be less annoyed with this book if that aspect had been borne in mind more throughout. Books like this are a dancing centipede - if I hadn't looked down three-quarters of the way through this would probably have been 3.5 stars. However, I did, and if I hadn't then I really ought to have done. It has a strong start, but progress is unoriginal, checking in with Things Which Will Be Important Later, passing Things Which We're Told Can't Happen Manage To For *Reasons* and giving a jaunty wave to Holding Out For A Sequel on the way past. Mentally comparing this to my other scores, I'm going to settle on 2.5 stars: until it all fell apart it was very good, but once it did it was a brainless Hollywood summer blockbuster and I'd really, really hoped for more.